The Churches around the world must pray constantly and the leaders of the world need to unite and come with short and long term plans on behalf of HAITI. We can see miracles that the modern world has never seen before, if we just call on God, He will answer. If we pray constantly to God for the lives of those who are trapped under the rubble, for those who need food and to keep those who are physically injured alive, then our prayers will be answered. There is nothing too hard for God. If we pray and believe with all our hearts, then God is willing and able to provide the answers for the people of Haiti. We need to know that the God of Heaven is the Alpha and the Omega. He was before the beginning and He will be there at the end. He was the same God who parted the Red Sea for the Israelites and He kept Moses on the Mountain forty days and forty nights without water or sent manna from Heaven. Recently, He saved the lives of the people in two American Airline flights. There are so many miracles that happen recently, so we need to continue praying for Haiti. Life is a gift from God and those who are under the rubble can live for days; man cannot predict what God can do. Remember, He raised Lazarus from the dead. It is the same God in Heaven who saved Shadrack, Mesheck and Abendego from the blazing furnace. If we constantly pray to Him, all that we asked and more can be fulfilled. God loves all mankind and His will is that we live a life of joy and Happiness and perfect peace. Things that seem impossible can become possible if we believe in the power of God. Keep praying and praying for those who need help most will receive help first. Pray that God will use those who are assisting the people to receive insights on the best way to do the job. We also need to pray for courage for all those who are suffering. We must admit that all these complications are beyond humans. We need heavenly interventions, Remember, there is nothing too hard for God. He is the only one who can turn the disastrous things into positive things. All we can do is pray and do all that are humanly possible and believe in God with all our hearts. Let us praise God for keeping the Airport from being destroyed. It was God who protected the lives of those who are still alive. Let us also thank God for protecting the rest of the world from the disaster that hit Haiti. If we make impossible requests of God, He can make them possible. Whatever you ask of Him, you must believe with all your heart and soul. Miracles are going to happen, just keep on believing. God is always in control. This is a time that the world is asking why such tragedy had to happened. We do not know the answer but we need to understand that God can make the situation right or even better. The world leaders need to unite and work together after those who are taken from the rubble, the sick have been given attention and the hungry fed, and help to rebuild Haiti. These people have gone through and are still going through great tribulations. The people of Haiti are a blessed people, full of life and many of them worship the God of heaven. The leaders of the world can put strategies in place that can make Haiti a better place. God blessed nations, he also blessed people so they in turn can be a blessing to other nations and those who are in need. Giving LOVE is the only thing that can save the world. We can only give true love if we first love God. Let us all work together to make Haiti a better place. 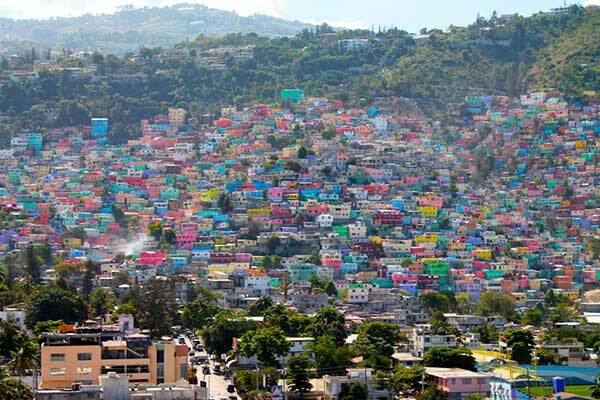 The love that is given to Haiti will spread around the world. The world needs love to be a better place for you and me.